It’s crucial to one’s reputation as a trusted seller to disclose everything. An auction house has the unenviable task of deciding whether to take the owner’s word or do the research themselves. Given the not insignificant buyer’s premium, and the often much-higher-than-their-cost shipping fees, I’d argue that they owe it to potential buyers to vet and verify all information provided to them. An auction at a reputable house is rarely a bargain hunt and an auction house is generally considered a small step below a museum as far as depth and breadth of knowledge of the items they deal in. Then again, we’ve seen some rather odd things at museums, haven’t we? I recall a bodice on backward, for example. We have seen some odd things in museums, and we aren’t shy about pointing out the mistakes! When buying at this level, one does expect a complete condition report. One also should have sympathetic customer service when problems are reported. In this case i was referred to the buyer agreement where I agreed to buy as is. That is tough when so many things can’t be detected through photos alone. Hm… I don’t like that one bit. Neither do I, and thus I’ll not be bidding there in the future. As an online seller who’s suddenly buying/selling in significantly larger volume, I can attest that it is very hard to spot and disclose everything, even though I try hard. I find that the best time to notice is when photographing. 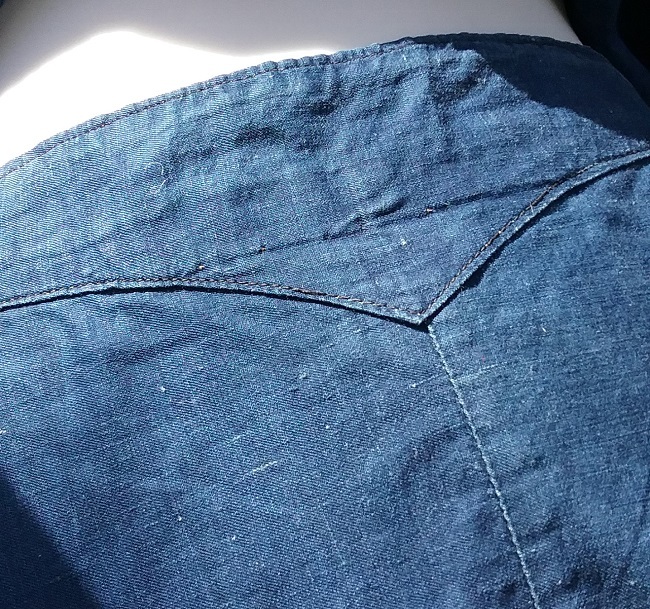 Somehow stains, holes and repairs are much more obvious in a photo, even when standing right next to an item I’ve already handled multiple times. However, I am not selling anything as old, valuable or unusual as your bathing costume. And I don’t use an auction format. There’s often quite a bit of back and forth, questions answered and more photos provided with my prospective buyers. I would also be disappointed that there is a plastic replacement button that wasn’t disclosed (while glass may be hard to find, what about at least MOP??). But — still a very cool item for your collection, as you say. 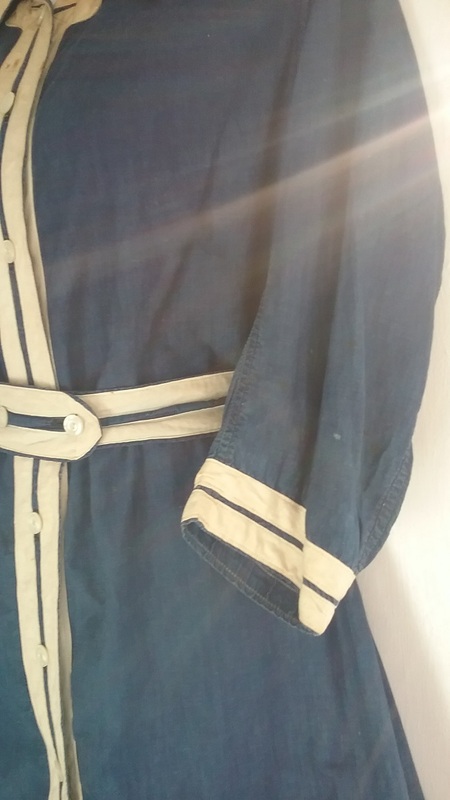 I spent enough time selling old clothes that I know how hard it is to spot every little thing. I appreciate the many sellers who go over and above to describe things in great detail. Were the they actually “permitted” to get wet ? As up tight and rigid as the rules were for exposure? Interesting and puzzling . They would get wet, at least partially. 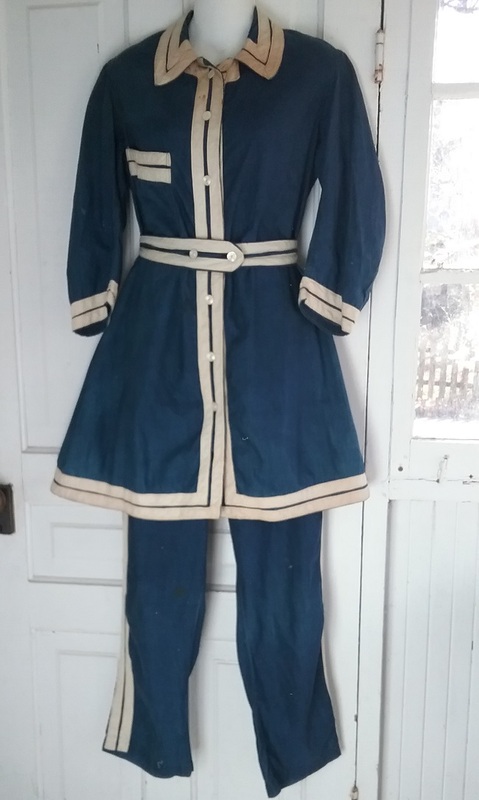 These suits were for bathing, which meant splashing around in the water. Swimsuits came later, around 1920, and were much briefer. I think a lot of sellers, unless they are truly experts, are pretty clueless about buttons, the difference between plastic, bakelite, MOP and glass, and the ramifications vis a vis age and condition. 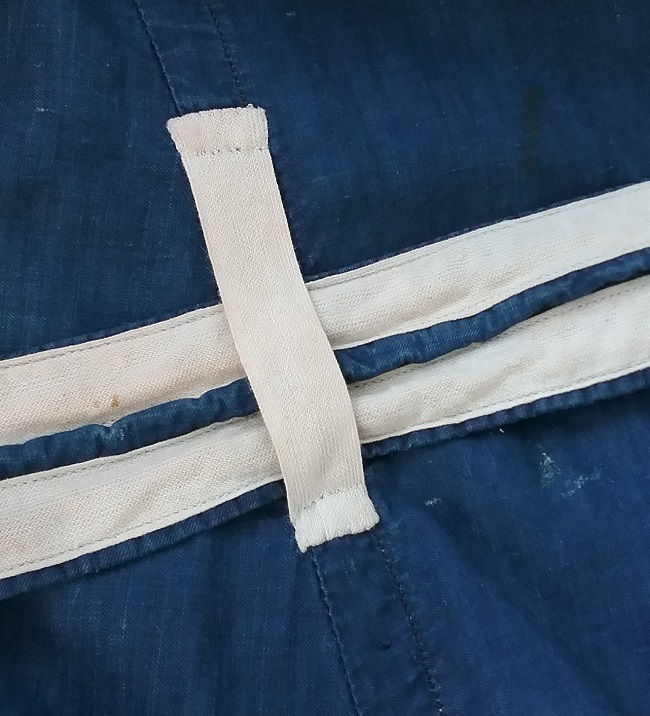 Not to make excuses for the auction house, it is after all their job to vet the things they sell, but buttons and kinds of thread are often overlooked due to lack of knowledge. Since this is an auction house that specializes in historic clothing, they should have known the difference. After contacting them about the buttons, they then insisted that the buttons were mother of pearl. I didn’t realize it was a place that specialized in historic clothing! Yes they should definitely have known better, and known how to identify the various materials that buttons were made from. Great information, as usual Lizzie. That must have been so uncomfortable for swimming. They wouldn’t have been swimming as we know it. Bathing was more of a passive activity which consisted of wading and splashing around! What a gorgeous bathing suit! And how utterly, utterly impractical to go even wading in. It’s no wonder the sleeves and pants legs shrank rapidly. Yes, it was a time when modesty overruled practically. What a find! Congratulations; it’s a joy to see that suit. I was interested in your observation that sleeveless bathing suits appeared in the 1870s and 1880s; sleeveless evening gowns seem to have made the same journey, appearing in the 1870s, worn in the 1880s (with the little ruffle) and disappearing again in the 1890s. (But I don’t think it was about tan lines, more about finding “new bits” of flesh to reveal….) I haven’t researched this in detail — just referred to “Victorian Fashions and Costumes from Harper’s Bazar – 1867 – 1898” for a refresher. That’s really interesting. 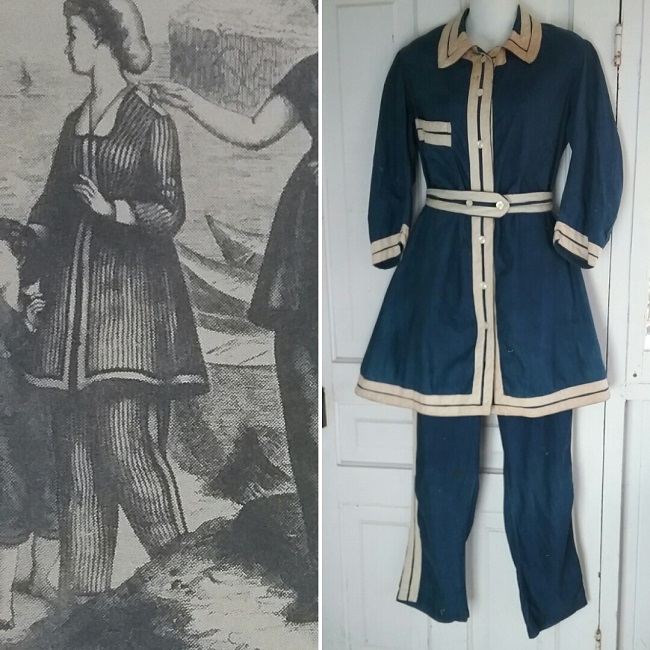 I have long maintained that bathing suit styles tended to follow evening fashion, so it’s great having evidence so early in the history of the bathing suit. And it wasn’t always about the tan lines, apparently! When I watched The Pallisers series recently, the sight of a sleeveless evening gown was really shocking to me — it looked so bare and exposed after the gowns of the 1860s. Another wonderful find that also showcases your expert skill and eye!! Congrats on such a rare addition to your collection! Ah, gee, whiz! You really are such a sweetheart!